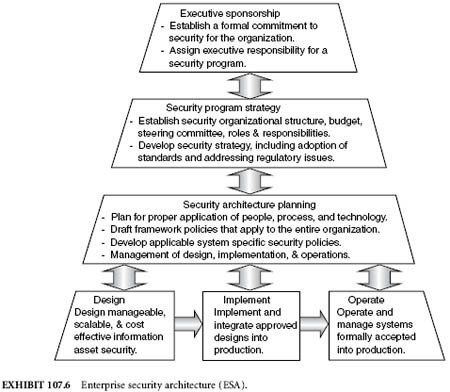 Enterprise security architecture (ESA) incorporates all aspects of security for an organization, including leadership, strategy, organizational structure, planning, design, implementation, and operations. It encompasses the people, processes, and technology aspects of security. Numerous models have been developed, and those that communicate sound security practices share a common approach to enterprise security. The ESA Model shown in Exhibit 107.6 is an open source model that this author has developed to communicate this approach. of a corporatewide security program. This directive will justify development of the security program, thus establishing the requirement to develop a security program charter. The security program charter authorizes development of a formal security program, and delegates an authority appropriate for the organization (e.g., the Chief Operating Officer [COO]). This executive would then typically delegate this responsibility by creating a CSO or equivalent position. Note that without executive sponsorship, the CSO will likely have difficulty applying and enforcing security directives that impact other departments. The CSO then formulates a formal policy statement in response to the corporate directive. This broad policy document will define the goals of the security program, as well as the organizational structure. These must generally be approved by the corporate Board of Directors. In this example, the CEO has designated that the COO is responsible for the security program, and the COO has delegated this responsibility to a CSO. Many organizations have appropriately created a CSO position that reports directly to the Board of Directors, which is preferable for organizations that face significant risks to their business from security breaches. A security program strategy is drafted to meet the business or mission needs of the organization. The CSO drafts the overall security program strategy by aligning the organizational approach to security with sound industry practices, and by leveraging common standards and practices such as the ISO 17799, COBIT, Common Criteria (ISO 15408), and NIST publications mentioned previously in this chapter. Application of the Security Governance Model can be applied in this layer to assist in marrying an effective strategy with an appropriate organizational structure. In many organizations, sound practices suggest that the CSO formulate a security steering group, or intra-organizational policy board, comprising representatives from each functional business area. Customer Operations, Engineering, Finance, Internal Communications, HR, IT, Legal, Marketing, and Sales are examples of departments that might be represented in this group. This steering group will oversee most security policy development for the company in order to establish the organization's overall approach to computer security. Planning the architecture refers to planning that takes place within an established security organization. Planning to execute security initiatives is an exercise in futility if executive sponsorship and security program strategy have not been established. Planning encompasses the people, processes, and technology aspects of security, and thus addresses policy, procedure, and technical implementation. Having established executive sponsorship and security program strategy for the organization, one can continue to develop the ESA. If COBIT has been determined to be the standard to be used by the organization, then guidance offered within the Planning and Organization domain falls primarily within this layer of the model, and the other three COBIT domains will each be spread across the design, implementation, and operations components of the lowest layer of this model. The model is scalable such that existing standards can and should be used, yet sufficiently flexible that no one standard must be used. Developing security policies is a critical component of this layer of the ESA Model. Again, selection of one standard does not preclude the use of other well-known and accepted publications. A sample approach to developing security policies in accordance with the guidance from NIST Special Publication 800-14 follows. Program-framework policies can now be drafted to establish the organization's overall approach to computer security. This is a set of corporatewide policy statements that establish a framework for the security program. Board-level direction is recommended for establishing most program policy statements because these policies provide organizationwide direction on broad areas of program implementation. This board-level direction is the fundamental function of the steering group, because representatives of the board are included in this committee. Policy statements at this level reflect highlevel decisions about priorities given to the protection of corporate data. Board-level direction is recommended for acceptable use, remote access, information protection (a.k.a. data management), data retention, special access (root level), network connection, system acquisition and implementation, and other policies, as required. Program policy is usually broad enough that it does not require much modification over time. Additional policies will need to be developed, and are categorized as issue specific and system specific. Board-level direction is also recommended for development of issue-specific policies, which address specific issues of concern to the organization. Whereas program-framework policy is intended to address the broad, organizationwide computer security program, issue-specific policies are developed to focus on areas of current relevance, concern, and possible controversy to an organization. Issue-specific policies are likely to require frequent revision as changes in technology and related factors take place. An example of an issue-specific policy is one that addresses peer-to-peer file sharing via programs such as Kazaa and Morpheus. System owners, versus board-level representatives, are responsible for systems under their control, and as such should establish system-specific policies for these systems. System-specific policies focus on decisions taken by management to protect a particular system. Program policy and issue-specific policy both address policies from a broad level, usually encompassing the entire organization. However, they do not provide sufficient information or the direction, for example, to be used in establishing an access control list or in training users on what actions are permitted. A system-specific policy fills this need. It is much more focused because it addresses only one system. In general, for issue-specific and system-specific policies, the issuer is a senior official. The more global, controversial, or resource intensive the policy statement, the more senior the policy issuer should be. Many security policy decisions will apply only at the system level and will vary from system to system within the same organization. While these decisions might appear to be too detailed to be policy, they can be extremely important, with significant impacts on system usage and security. A management official should make these types of decisions, as opposed to a technical system administrator. Technical system administrators, however, often analyze the impacts of these decisions. Once a policy structure is in place, the overall planning and management of the security life cycle is maintained at this layer of the ESA Model.